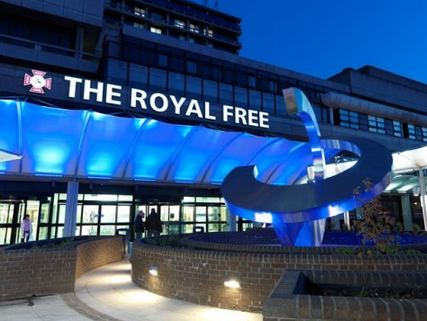 A year ago today, I checked in to the Royal Free Hospital Hampstead to have a stomach GIST removed, and with it, the whole of my stomach and spleen: time now to look back, on the year since – and before. It all began some eighteen months earlier, in the summer of 2014, when I began to experience what I incorrectly described as “stomach” pains – and the GP described more accurately as abdominal pain. He diagnosed a bowel complaint, diverticulosis, and prescribed antibiotics. This brought some relief, but some residual pain remained – so another course of antibiotics. After the third such attempt, he said we needed to take a closer look inside the bowels, and referred me (under the “two week rule” to a bowel specialist at Royal Surrey for a colonoscopy. I had not previously heard of a two week rule. When I looked it up later, I found that this applies whenever there is any risk of cancer. Alarm bells were ringing. The consultant agreed with the GP diagnosis, but also that we needed a test to check, just to “confirm the diagnosis”. However, instead of the colonoscopy, he recommended a CT scan, because that would show what was going on outside the bowel, as well as inside it. That decision was of major importance. Under the two week rule, everything had moved quickly to the date of the test – and much more quickly thereafter. The scan was done early afternoon on a Wednesday. The next day’s post brought a letter telling me of an urgent appointment the following Monday with the consultant, not at Royal Surrey but at my local hospital in Haslemere. There he told me that the bowels were clear, but that the problem was in fact a GIST – “Gastro Intestinal Stromal Tumour”. Again, I had never previously heard of this, but did take note of the word “tumour”. He also showed me the scan image on his computer screen, noting that the tumour was “massive” – bigger than the liver, which is a large organ. He told me that he would be discussing this in the hospital’s regular Tuesday MDT meeting the next day. I went home break the news to my partner Raymond, and went online to research this “GIST” thing, and quickly found information on assorted cancer websites – and on the very valuable GIST Support UK website. I noted that although the consultant had very carefully avoided using the word “cancer”, on all the information sites I found, including an NHS page, it is routinely described as a “rare form of cancer”. Two days after seeing the consultant, I had a call from a hospital specialist nurse, telling me that an Upper GI specialist wanted to see me urgently – on Friday of that week. He went over the basics of what GIST is, and what I should expect. More tests were needed (a PET scan, and an endoscopy), but indications were that the tumour was too big for surgery, so I would most likely be initially on this modern wonder drug, Imatinib, to shrink the thing. He also said that surgery, when it came, would probably include the removal of “most, if not all, of my stomach”. Warned by our website to be treated only at a specialist centre, I asked about his experience, and was assured that he did have some. (Royal Surrey is not included on the GIST Support listing of specialist centres). I left that meeting with a letter of appointment for an endoscopy, and a promise of an urgent appointment for a PET scan, which indeed followed promptly. I was then called again by the specialist nurse, who told me that I would need to see a specialist oncologist in Royal Surrey’s cancer wing – but this might not be too soon, as he was away on holiday. A day or two later, a second call told me to see the oncologist the following Monday at 9am – his first day back at work. Although it had taken a llttle while for the GP to realise that the problem was not in fact diverticulitis (not his fault – that was what the symptoms indicated), everything from his letter of referral to finally seeing an oncologist in the cancer centre was remarkably swift – no more than about a month in total, including three tests (CT, endoscopy and PT scan) and four consultant appointments (two with the bowel man, the upper GI surgeon, and the oncologist). I thought that was pretty damn impressive. Again, I asked about experience with GIST. I was told that although not a GiST specialist as such, he did have some experience, and that RSCH was a specialist centre for stomach cancer. Mindful of the speed with which things had moved up to then, and of the much greater convenience of treatment in Guildford rather than in London at the Marsden, I agreed to stick with St Luke’s Cancer Centre at RSCH. By now, I’d done copious reading about GIST, and learned a lot – especially about the wide range of possible side-effects. The response was that “in his experience”, these were in fact usually not severe. Most people, I was told, did not have too many problems. I’d been expecting to go home with my first supply of this remarkable drug I’d been reading about, but no, I learned – it doesn’t work like that. He agreed that I should be put onto imatinib, but his decision was not enough. He would apply for approval, and only once it came, could I be given it. So I went home, to wait. In the broader context of cancer generally, I thought I was getting off lightly. I was relieved to learn that for GIST, radiotherapy and (conventional) chemotherapy are not effective – so I’d be spared that. I was also relieved the tumour was too big for surgery and loss of stomach: I’d have time to get my head around that idea, which was also not an appealing prospect. There was something else that helped keep my spirits up. Right from the start, I’d been open about sharing news of my condition and treatment with my partner Raymond, and by email with my daughters, sisters and a (selected) circle of friends. For those less close to me, I initially wondered if perhaps I was giving them too much information, but found that on the contrary, they welcomed it – and asked me directly to keep them up to date with progress. I was happy to do so, and found that regularly writing about these things, to them and on our email list, was of great value in helping me to process what was going, and so to deal with it more easily emotionally. Then came a letter telling me of an appointment with a chemotherapy specialist nurse. That sounded ominous – had there been some sort of misunderstanding? I thought I’d been told that chemotherapy would not be appropriate: did I have “cancer” after all? Of course, it was much simpler than that. Although not “chemotherapy” in the popular sense, imatinib is in fact exactly that – just taken orally, and much more conveniently. My treatment on had been approved, and it was time to take delivery – but not before I’d had a long discussion with the nurse on what It is, how to take it, and the possible side effects. Of these, I was most concerned about the prospect of diarrhoea. I was working part-time as a delivery driver, and alarmed at the difficulties this could pose if I was caught short while out on the road. It didn’t help that when I asked the nurse about this specifically, all she could suggest was that I kept a set of clean underwear and trousers in the car. On the other hand, I’d also read that for some people, side-effects included some regrowth of previously balding hair, or the return of colour to greying hair. I said to the nurse, those would be my choice, please. When I took my first tablet the next morning, I was somewhat nervous: not at what would happen, but at what could conceivably happen. I took it – and nothing happened. Then and since, I’ve had almost no side-effects from the drug. There was some mild dizziness on just two occasions, and much later a little cracked lips, and some puffiness of the eyelids, with some occasional watering of the eyes. None of the dreaded diarrhoea, at all. My life continued pretty much as normal – apart from regular visits to Royal Surrey every three months for a CT scan, a blood test, and to see an oncologist. From the start, these showed a good response to the drug, with satisfactory shrinkage from the original 26cm to 15cm. Then suddenly, no more.